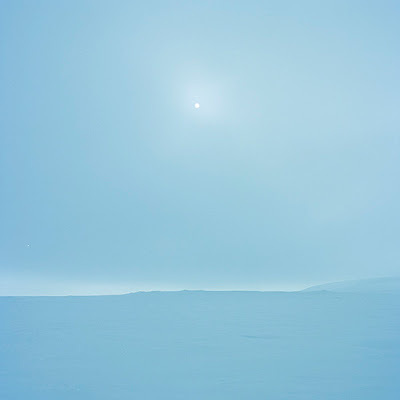 Céline Clanet is one of the winners of 2008's Photolucida's Critical Mass Book Award. 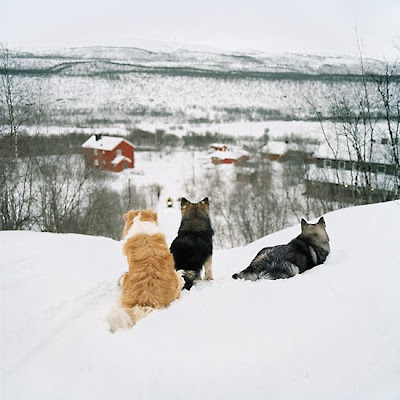 Her photographic work of the European Artic first introduced me to this rural part of the world. 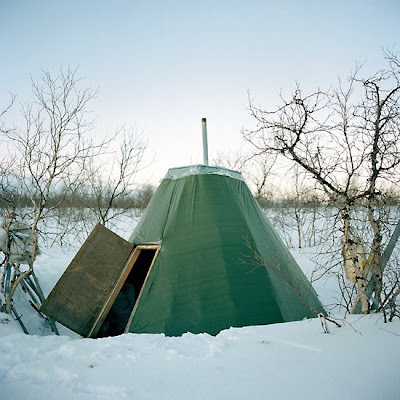 The series, "Maze" contains sincere photographs of the people, the landscape, and the emotions of the Artic. I cannot wait until Céline's book releases from Photolucida and we're so glad to have her participate in our Conversations series. Céline Clanet: I was born in ‘77 and raised in the French Alps until I was 18. I spent my childhood playing with dogs, breeding several armies of snails, ballet dancing, fighting with my older brother, and strolling endlessly in the mountain behind our house. After some time spent in London and Arles - where I studied at the Ecole Nationale de la Photographie - I have now been living in Paris for over 10 years with my man and son. I share my time between photography, graphic design, planning the next trip to somewhere far, trying to play music, and regularly being forced to watch hours of Peppa Pig and the UEFA Champions League. CC: I was about 14, and I was living with my grandmother during some painful teenage years. I was spending much time in her messy attic where there were remains of an old (very old!) photo lab, and I started to experiment B&W printing up there. By some miracle, I managed to process films and prints, and loved doing it. One day that I was digging about up there, I discovered a little suitcase that happens to be a treasure: the oldest family pictures were in it, hundreds of them. My grandmother had been searching for it for many years, and was deeply moved and grateful to see it again. I felt like Wonder Woman (attic & suitcases section). We spent many hours looking through the photographs together. I realized that this suitcase was our family memory indeed that those events and dead people only existed inside it and nowhere else. Photography fascinated me. It could make things last forever and make dead people talk again. It made me understand that your life only exists because you remember it. "Each time you forget, you recall death" once wrote Maurice Blanchot... That definitely hooked the disturbed teenager in me. 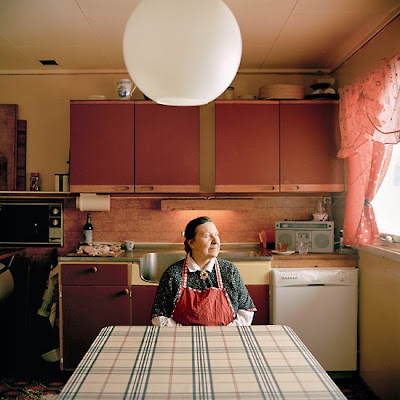 The relationship between photography, identity, death and memory is something that never left my thoughts since then. It tints all my works, even if it's in a very light color sometimes. For instance, I first fell in love with Lapland when I was 8 and watched a Japanese anime adaption of "The Wonderful Adventures of Nils Holgersson" on French television. I was already very much into Polar world, but Lapland never left my mind since that anime. The landscapes and animals looked so great. Far and different, yet on my own continent. And the goose could talk! 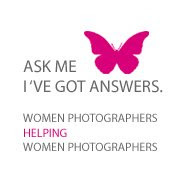 CC: I use the photographic medium mostly as a tool and pretext to experience the world. 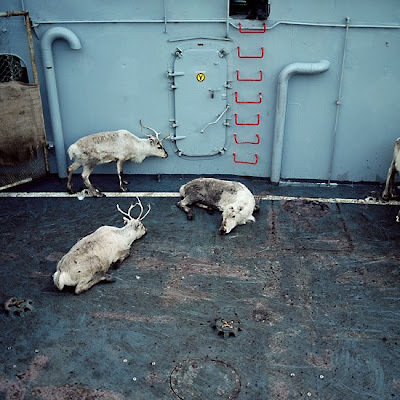 I probably wouldn't have spent months in the Arctic if it weren’t to make pictures. 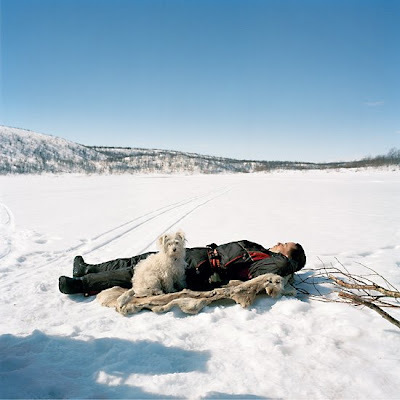 The fading and fragile Sami land and community are one of the only Artic indigenous people of continental Europe and it became my obsession years ago. Most Europeans don’t even have a clue about their neighbors to the north. 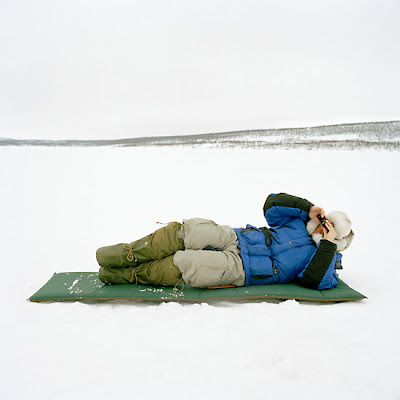 At that time, I was not very keen on the photography I had seen about Lapland so far. The pictures focused on costumes and traditions. Cliché photographs of the “exotic” traditions make boring pictures, wherever they are taken in the world. I wanted to show more than that. It took me almost a couple of years to prepare my Máze project. I had already been traveling in Lapland before, but as I wanted to stay several months to start a photo project decently, it needed tough organization. 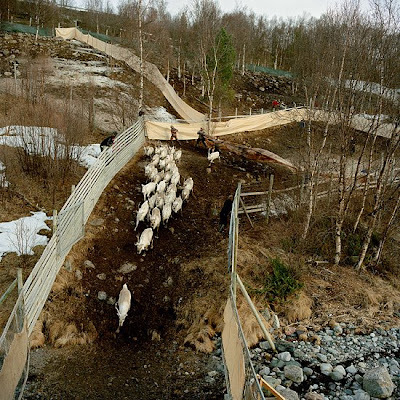 I passed my driving license, bought a car, started Norwegian lessons, met ethnologists, studied Sami history more, searched for funding, spent all my money in boots and down clothes, wrote to many Sami people, and eventually found a place to stay up there, in Máze. Then in spring 2005 I drove my car from Paris to Máze and stayed 3 months up there as a first journey. Lucky me, I hit upon the most amazing place in whole European Arctic. 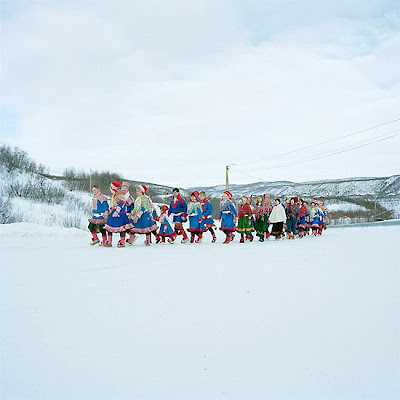 Máze is beautiful, precious, unique, wild, and full of amazing people and crazy reindeer herders. 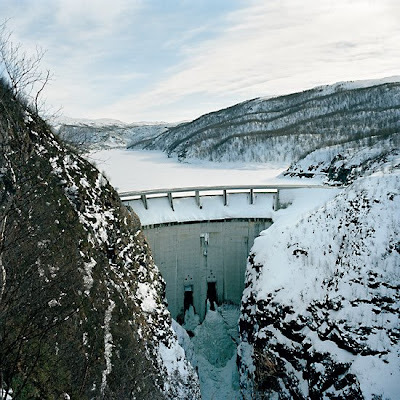 Máze has a very peculiar and moving history, as it was saved from the waters of a Norwegian dam project some years ago. 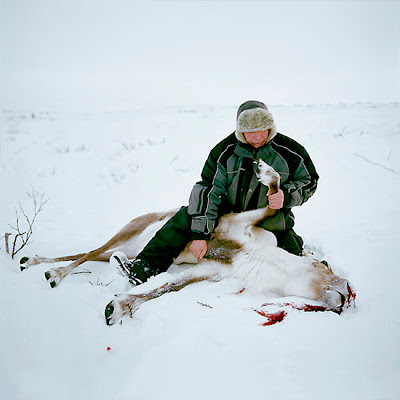 People's relationships with territory, animals and time is very peculiar there, and I focused pretty much on that. Being a photographer in this village was like being a starving rabbit in a giant carrot field. Since that first trip, I try to travel there once a year. And became a snowmobile addict. CC: I am just back from a trip in Máze, and I'm gathering the last pictures and texts for the Critical Mass book, that will hopefully be out later in 2009. I'm preparing my first show in US, planned early 2010. 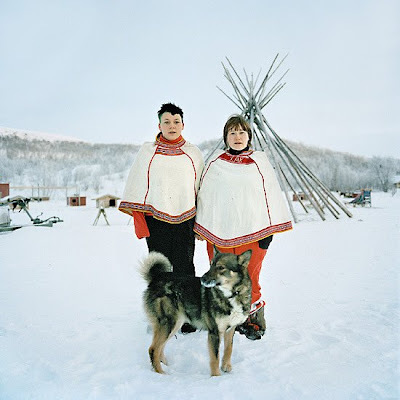 I still work on another Arctic series that explores Lapland landscape, "Sápmi". I have driven thousand of kilometers in Finnish, Swedish and Norwegian Lapland: next step will be Russian Lapland, where I have never been yet. I've also been working since several months on a series about my home area and family in the Alps. AND, I am searching for the great Gallery that will make me the wealthy artist I always wanted to be. Then I could buy this Ski-Doo snowmobile of my dreams and break my last speed record on Máze river, yeah! To see more of Céline Clanet's work, visit www.celinette.com. 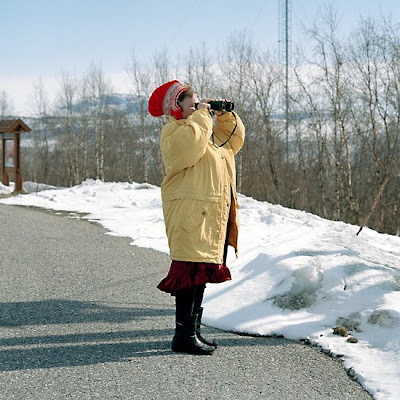 Thank you Céline for being so candid about what brought you to photograph in Lapland and how you did it. The bits of snow mobile talk made me chuckle. Book Release: Issue 4 of The Exposure Project!